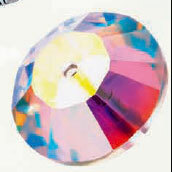 Swarovski Crystal Sew-on Stone 3128 XILION Lochrose exhibits superb brilliance resulting from the revolutionary XILION cut. The Lochrose is a sewon stone with just one hole in the center. Many people refer to it as a "sequin" because of that. The Swarovski Sew-on 3128 Lochrose was launched sometime in 2004 after they introduced the copyright protected XILION technology. These crystal sequins are applied pretty much the same way as you would a normal sequin and is ideal for the fashion, accessories, interiors, and jewelry segments. They add an unmistakable sparkle to beaded embroidery and are used by some of the most renown jewelry artists around. The Swarovski Lochrose is an undiscovered paradise as many Swarovski lovers are unaware of their existence and of their extreme versatility in bringing a design to life. The Swarovski 3128 XILION Lochrose is a design elements treasure house as they are offered in many, many colors over a range of sizes. Swarovsky Sew-on Stone 3128 XILION Lochrose is available in these sizes. Click to view the full info. Opens in a new window. I so happen to have on me some lovely photos of the Swarovsky Sew-on Stone 3128 XILION Lochrose in the latest effect and color, as at Feb 2012. (Photo Credit: CREATE YOUR STYLE). This is sure to whet your appetite so be forewarned!